Tokyo (VNA) – Prime Minister Nguyen Xuan Phuc, on May 27, met several foreign leaders on the sidelines of the expanded Group of Seven (G7) Summit in Japan’s Mie Prefecture, affirming that the Vietnamese government is determined to deepen economic ties with partners. Meeting French President Francois Hollande, the Vietnamese PM wished that both countries would improve their mechanisms for exchanging and coordinating economic and national defence-security cooperation, and push forward investment across infrastructure, transport, energy, aerospace aviation, agriculture, food processing, pharmaceuticals and green industries. He also asked for France’s support for Vietnam to access the World Bank’s international development assistance (IDA) beyond 2017. The two leaders agreed on steps to double two-way trade in the near future and work closely together to realise the Paris Agreement adopted at the 21st Conference of the Parties to the United Nations Framework Convention on Climate Change. In a meeting with Canadian Prime Minister Justin Trudeau, the PM urged Canada to offer technical assistance to Vietnam to improve its enforcement of the Trans-Pacific Partnership and encourage Canadian firms to invest in Vietnam. Trudeau, for his part, promised continued support to Vietnam, including its bid for selection as a non-permanent member of the UN Security Council for 2020-2021, as well as favourable conditions for Vietnamese nationals living in Canada. 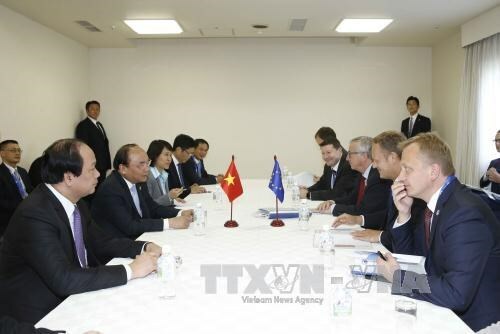 In separate meetings with President of the European Commission Jean Claude Juncker and President of the European Council Donald Tusk, the Vietnamese leader asked the EU to offer technical assistance to Vietnam to carry out the recently-adopted Partnership and Cooperation Agreement. The two sides spoke highly of the conclusion of EU – Vietnam free trade agreement negotiations and pledged to work jointly to materialise the deal. Earlier, the PM met bilaterally with German Chancellor Angela Merkel, UK PM David Cameron, US President Barack Obama, Italian PM Matteo Renzi and President of the World Bank Jim Yong-kim. Merkel backed Vietnam’s proposal to delay its IDA graduation and promised to visit Vietnam at a convenient time. Expressing concern over drought and saltwater intrusion in Vietnam, Cameron was committed to directing the UK embassy to consider specific projects in support of victims in the country. US President Obama thanked the Vietnamese people and the PM for their hospitality and warm reception during his recent visit and said he will speak of Vietnam’s considerable progress with G7 countries on the occasion. WB President Jim Yong Kim described Vietnam as a top priority in accessing preferential IDA, adding that he is willing to help Vietnam with the use of renewable energy, particularly wind and solar energy. The Italian PM appreciated Vietnam’s stature in the region and wished to boost bilateral economic ties, partly by facilitating and doubling Italian investment in the country.